Underserved reputation because it lacks Autoformers . Amazing build quality. Tremendous soundstage, imaging and detailed sound,beautiful appearance with characteristic blue lights. This amp has zero noise. The only way you can tell it's on are the blue lights in the power meters and McIntosh name. The bass is deep and clean with punch but not boomy, The highs are crisp and bright but never shrill and the midrange is up front. I had mine tested and it put out 425 watts per channel before the power guard kicked in. This amp is amazing. The only thing I don't like about this amp is the volume controls are on the back side and a little difficult to reach but once it is set you never have to touch it again. I have been a long time McIntosh user since 1982. This amp does every thing that I ask, crisp airy highs tight and abundant bass. I love this gear. Heavy Machinne but pure power and sound. In my long search to find the closest to reality sound, I found an opportunity to buy a used 300 MC. You already have 19 years manufactured. But he had kept good time .... waiting for me. He came alive to me, his blue eyes reawakened for me one of the greatest satisfactions of my life hearing. Impressed by his ability, clarity and depth of sound. I have it with Dynaudio Excite X38 speakers. It's a crazy combination. MAC is the best and this is a true classic MC300 90's. If you have the opportunity to have or buy one, keep it, is a real gem. Fantastic value! This kid had this amp and it had a buzz it(polar switch had dust in the contacts) and asked me if I wanted to buy it. At the time I had no idea how much it was worth but being a musican I remembered the old MC60"s and MC90's guys used to play bass through. I gave him 250.00 for it and pick up a MC26 pre-amp off consignment from a music store for 75.00 and there is nothing that can pry my hands off of this MAC! I also bought 2 heathkit speakers with altec A-7 horns and altec 15" speakers for 475.00 and reconed them one time sense 1989. I can here a triangle anytime one is used on a song. A two-way system with the magnets of the horn and woofer aligned is a beautifully phased sound. Remember the old "gray boxes hanging at Disney". Happy days! This amp is one of the best 2-channel solid state amplifier out there. Period. After this model, MC300, McIntosh up'ed the high frequence range on latter models, e.g. MC352, MC402, to probably attract more buyers especially the younger audiences. But I noticed that their latest model, 2011 model year, eg. MC452, MC303 2-channel amplifiers, seems to go back to the MC300 principal sound, smooth and roll-off at extended high frequency range. Well, if you have one MC300, hold on to it for life. It is pure and original Mcintosh sound. Warm yet detailed sound. Amazing build quality. Price! But you get what you pay for in life. I , like many others on this site, purchased this unit used. It took a long time to find one, but when I did I snapped it up. What can I say, Liquid,liquid, liquid. The sound coming from my Thiel 3.6's now that they are powered by this big Mac is wonderful. I can listen for hours with no fatigue at all, even with red book CD's! And of course, that great look and fantasic build quaility. It's to bad that some people that come onto this site leave some unfair reviews on products. I highly recommend this amp. Like I said, works greta with Thiel speakers. No noise. Tremendous soundstage and imaging. Beautiful appearance with characteristic blue lights. It is an ever difficult task to balance benefits and costs, and I found MC300, along with C40 Preamp, B&W N804 and Kimber wires and cables, to be as close to ideal as anything I have tested. On the upper price range, I have listened to much higher priced Mark Levinson Monoblocks; ML may boast more accurate musical reproduction, but I did not feel a significant difference that would justify the price difference. If anything, I preferred the warm sound of MC300 -- it felt softer, gentler and very smooth. On the other hand, I listened to NAD and other amps that cost less than MC300 (MC300 most certainly was too expensive for me), but the difference between MC300 and NAD was too obvious to ignore, for NAD did not sound too different from the $600 Harman Kardon that I had had for the past 10 years, and it did not make sense to upgrade to NAD. I wanted a major change in sound, although MC300 was a bit pricey, there simply was no middle ground for me. I mostly listen to classical music (strings, vocal and piano), and I found my system to be fully satisfactory for now, and probably for a very long time to come. I could not wish for more. Music reproduction, performance, build quality, soundstage, detail - just good clean power! I purchased this amp with a matching McIntosh stereo preamp just over a year ago. I would not nor could I ever go back. 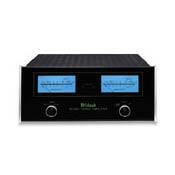 As with most hobbies, you can reach that point of diminished returns on investment - Not so with the McIntosh equipment. When I changed to the Mac equipment over my previous, I instantly learned quality over quantity. The clarity and detailed reproduction of music is fabulous. I have since purchased their MVP831 DVD/CD Player to kill two birds with one stone. The video section is super, the audio section with the Burr Brown DAC is amazing. Not to sound too much like an audiophile who speaks mostly to justify the amount he shelled out, but.... the blackness from which the sound eminates and its clarity is spine tingling. I auditioned many other amps prior to this purchase with numerous speaker set ups. The Mac pieces with my Velodyne sub and KEF Audio Reference 2 speakers produced the most pleasing combination for me. I've listened to systems costing from $1000 - to $150,000. If money was no object, I would still take mine...I'd just duplicate it in every room!